On Sunday, Raquel Diaz, a sister with the Los Angeles Archdiocese, succumbed to her injuries. She was seventy years old. The beloved Boyle Heights nun was crossing Evergreen Avenue at Winter Street at 5:20 p.m. on December 13 when she was run down by a driver in a white, four-door Nissan or Toyota. The loss of someone who had been such an integral member of the community for more than 30 years has devastated those who knew her. But residents are angry, too. The intersection where she was struck is one they have complained about for years. Drivers have long sped through that intersection, seemingly unconcerned that the street’s incline limits visibility precisely at Winter Street — a key crossing for families moving back and forth between the church and the school. The road diet the street has had for some time (north of Cesar Chavez) seems to have done little to slow it down. Evergreen is one of the few streets that offers drivers a straight shot between Wabash and 4th Street, allowing them to connect more easily with City Terrace or the southern end of Boyle Heights. So, drivers of delivery trucks and private vehicles alike tend to run it like it is a gauntlet, doing their best to avoid having to stop for the lone stoplight at Malabar (halfway between Wabash and Cesar Chavez). Street design and other amenities surely have a role to play in making this street safer. Pedestrian lighting would do much to improve visibility at night. Stop signs interspersed between Wabash and 4th would help slow the street down. So would flashing lights at Winter, Blanchard, and Boulder — three intersections with crosswalks linking pedestrians to a school, a church, and a local market. Flashing lights would be especially helpful at Winter, as the yellow crosswalk there is both awkwardly located (thanks to the hill) and harder to see at night than a white crosswalk. His support for such fixes is vital; without it, the likelihood of improvements coming to the street any time soon is probably not great. The High Injury Network, as mapped out by LADOT. 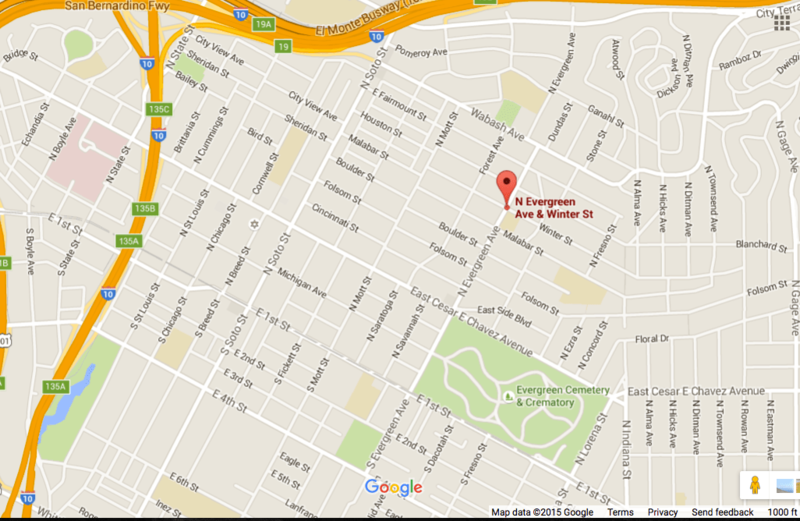 Only a few streets within Boyle Heights are part of that network. Source: LADOT (click to enlarge). In Boyle Heights, Great Streets’ work is focused on Cesar Chavez Avenue, Safe Routes to School monies will be used to target intersections near schools on Breed and Sheridan Streets, and improvements planned as part of the Eastside Access project are focused on those located between Boyle Avenue and Soto Street. Vision Zero — the citywide effort to reduce traffic deaths to zero by 2025 — prioritizes addressing the conditions along streets that make up part of what the Transportation Department (LADOT) calls the High Injury Network (at right). And within that network, according to LADOT’s strategic plan, the top ten corridors will be prioritized for attention first. Cut-through streets like Evergreen, in other words, are likely to be last to see improvements. The appearance of only a few of Boyle Heights’ streets on the High Injury Network map is largely due to the fact that they have seen fewer reported collisions than major streets in other neighborhoods have. But it is also partly due to the fact that there is significant under-reporting of the very kinds of collisions the LADOT says it wants to address most — collisions between cars and cyclists or pedestrians. Boyle Heights is a transit-dependent and heavily pedestrian community. So, anecdotally, it is not at all uncommon to meet residents that have experienced multiple near misses, minor scrapes, or even bike-mangling hit-and-runs. But because of the poor relationship some in the community have with law enforcement, the desire to work things out between the parties without involving the police, the sense that it is not worth the time to report a collision, or the parties not realizing a collision should be reported, the authorities are never informed. Which is not to suggest that a pedestrian on Evergreen is subject to the same level of peril as one on a busy arterial corridor like Vermont Avenue. But rampant under-reporting does suggest we don’t know as much as we should about the safety needs in Boyle Heights and, by extension, other lower-income immigrant communities and communities of color. To ensure all of L.A. benefits from efforts to implement Vision Zero, LADOT may need to spend some time on the ground engaging residents and observing intersections in communities where under-reporting is suspected. All that said, even if we did have a full accounting of all of the collisions seen in the area and did our best to design and implement fixes to limit them, we would still struggle to address the a**hole factor. By which I mean there is only so much that can be done to protect against people determined to drive without regard for human life. You see them every day: people who blow through red lights; people who text while driving; people who floor it through crosswalks to beat the pedestrians just stepping out into the street…shall I go on? While media coverage around things like hit-and-runs has improved over the last couple of years, the prevalence of such incidents, the harm they cause, and the minimal punishment perpetrators receive (either for hit-and-runs or incidents where a driver stayed on the scene but was clearly negligent) signals that, culturally, we are still reluctant to classify these cases as incidences of violence. And the opposition raised every time advocates seek to slow busy streets or make room for other road users (via bike or bus lanes) suggests we don’t care enough about the problem to try to prevent those collisions we actually can mitigate through better design. In the hopes of changing that culture, Los Angeles is looking to bring an artist on board at LADOT to inspire Angelenos to contemplate the greater good and reconsider how they move through the public space. Whether that approach will work remains to be seen. In the meanwhile, perhaps the case of a hungry New Yorker can serve as an inspiration (a cautionary tale?) for us to change our ways. 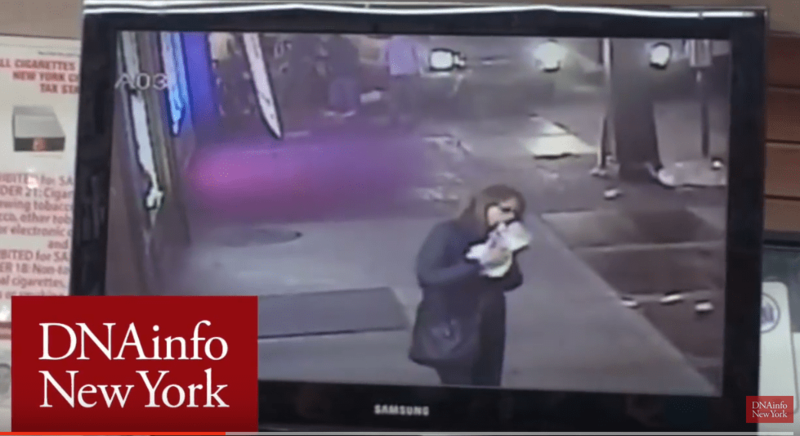 In the video below, a woman eating a slice of pizza hears the commotion behind her, turns to see Victoria Nicodemus crushed and bleeding under the wheels of a vehicle that has jumped up onto the sidewalk, takes another bite of her pizza, and keeps walking. We can be better than this woman, Los Angeles. By which I mean we can stop looking the other way and shrugging off traffic violence as a sad but inevitable price to be paid for living in a busy city. We can’t prevent all the a**holes out there from committing hit-and-runs and other terrible acts of a**holery, unfortunately. But by actively supporting better street design, demanding our city leadership make the streets of our communities more accessible, agreeing to sacrifice speed for safety, and acknowledging all road users are entitled to safe passage, we can begin to mitigate their ability to do harm. So, put the metaphorical slice of pizza down, Los Angeles. More than 200 people die in traffic collisions every year in our fair city; almost half of those killed or severely injured in crashes tend to be cyclists or pedestrians. We have work to do. I’m surprised to hear there was street traffic calming done here. Google Street View from May makes the street look about 50 feet wide with no pedestrian amenities but a few stripes on the road. I looked it up, but couldn’t find when the road diet went in. It’s been there for a bit, I think, but probably no more than a couple of years. And it is just in the section north of Cesar Chavez. It’s too narrow alongside the cemetery. HAWK beacon signals are worthless. only an 85% effective rate. Best other than a solid red is the flashing red lights at 97% effectiveness. There should be slanted parking and a bulbout at this intersection, and the turn lane should be eliminated by widening the sidewalk. The center turn lane was added some time ago on Evergreen but no lanes were removed. I am glad to see in depth coverage of a hit and run and the neighborhood level point of view but troubled that streetsblog has not provided any coverage of this detail for Highland Park. Fig has seen high profile collisions that have gone totally unreported by streetsblog. Is this like a contract or something, are you only allowed to cover South LA and Boyle Heights? For what it’s worth, I’m pretty sure if the BHNC puts this on the agenda, and deliberately asks CD14 and LADOT for measures to slow down traffic and/or improve safety on Evergreen, it can happen. Actually, yes, I was brought on to cover South LA (and later Boyle Heights) as part of the California Endowment’s interest in seeing hyper-local engagement on health and livability issues in those two historically disenfranchised communities. I desperately wish I could cover HLP (and also Macarthur Park and Pico-Union…) — not only the hit-and-runs but other issues there as well, but I am stretched thin covering two deeply different communities as it is, and could not do it justice. It’s taken years to build connections and trust and a knowledge base in the communities I work in now, as it is. THAT SAID, Joe absolutely did cover the recent collision that killed young Andres Perez and there has been coverage of the safety issues there, as well as the fight between Cedillo and some members of the community over what a safe street should look like. Could we do more? Yes. Thanks for the info. about Evergreen. I knew the center turn lane hadn’t always been there, but wasn’t able to dig up when it went in (or why better crosswalks didn’t go in…). What a hideous and untenable thing, we collectively agreed in pausing our trajectories to render assistance, to see this poor woman so fragile and afraid in the street like this. Yet data suggests we generally don't appreciate how vulnerable others are or how much power we have to hurt each other until it's too late - and pedestrians and cyclists tend to pay the steepest price for that.